Rioja – the most famous wine-growing region of Spain. Only the region of La Rioja was awarded in 1991 the status of DOCa (Denominacion de Origen Calificada), the highest category of the classification adopted in Spain. It is believed that the first vines in this region began to cultivate the ancient Romans who settled sometime in the valley of the Ebro. They are also taught winemaking locals. However, Rioja wine has long been little known; Of course, they were exported outside the region and sometimes even successfully sold, but about any major successes can not speak – the fact that they were pretty simple and commonplace. Winemakers tried to improve their products; in the Middle Ages have been attempts to legislatively approve the rules of vinification. Official quality control bore fruit, but, nevertheless, as the Rioja wine region had local significance until the second half of the XIX century. Helped Rioja … phylloxera epidemic. When this terrible attack has spread in France, many famous winemakers in this country tried to import grapes from other countries or even find a new field for their activities. In particular, the master of Bordeaux turned their attention to Spain. And they found that the Rioja in its climate and soil characteristics can be very promising. Today, there are produced a variety of styles of wine – red, white, rose and sparkling wines, young and aged. 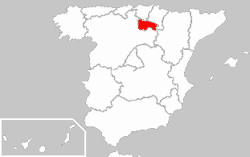 Rioja is located in the valley of the Ebro (by the way, from the name of one of its seven tributaries, rivers Okha (Rio Oja) where the name of the region); in the north it borders on the mountain range Sierra de Cantabria, in the south – Sierra de la Demanda. This location is very well, the mountains are covered with vineyards from cold winds, and numerous rivers create a special microclimate that protects the vines from potential frost. Rioja Alta is influenced by the Atlantic Ocean: the summer is hot, rainfall is little, but the early spring frosts. Most of the vineyards located at an altitude of 700-800 meters above sea level. Rioja is divided into three zones: Rioja Alta – a powerful, full-bodied, with high acidity and medium alcohol content – have the highest potential for aging. Rioja Alavesa – both white and red wines have an unusually fresh, clean and bright flavor. They are most often used by young, however, these wines are of excellent quality. Rioja Baja – is slightly less than 21 thousand. Ha. The wines have a fruity aroma and a high content of alcohol. Kitchen Rioja – in it sufficiently shows the influence of the Basque, Navarre and Aragon cuisines. It is common tradition is “tapas” (small snacks served with wine or other alcoholic beverages. It can be cheese, ham or seafood). One of the main products of the Rioja region cuisine is meat. So it is very popular with grapes chops, roast lamb, marinated partridge and riohsky chicken. From the fish dishes the most popular dishes of cod and trout. Among the vegetables it is considered to be a staple of potatoes, of which prepare many local dishes. From vegetables cook a lot of soups: garlic, gray (soup of milk, bread and lard). Popular steamed vegetables with meat, stuffed peppers, where the stuffing of meat and bread. As in the rest of Spain, in La Rioja one of the main products is cheese. Thus, in particular, it is very popular de Cameros cheese, which is made from goat’s milk. Confectionery mostly made from almonds. Typical Rioja – Potatoes in riohski (patatas a la riojana) – boiled potatoes with choriso (chorizo) (pork sausage); White beans stewed with pork sausage choriso (alubias blancas con chorizo); Rioja traditional sweets are very diverse, especially Marzipan can be distinguished from Soto (Mazapanes de Soto).